Losing a arm, leg, hand, or foot is usually a real life changing situation for an individual. Not only do they suffer greatly through the amputation and accommodation they have to make to adjust to their new way of living but some people experience pain there after the limp is gone. Phantom limb syndrome is a sensation that an amputated or missing limb is still attached to the body. 60% - 80% of people who get a limb amputated usually experience phantom limb syndrome and most of the sensations are painful. Phantom limb can also occur with the removal of body parts such as breast, eyes, genital areas etc. people experience sensation as if the limb still exist and moves with the rest of the body. People feel itching twitching and will even attempt to pick things up with the non existent limb. Phantom Limb is usually caused by the reorganization of the sematosensory maps in the brain. When a hand is amputated the sensory motors from that face invade into the vacant area as a result stimulus applied to the face now activates the hand region of the brain and rises sensation from missing phantom hand. Many solutions are being created to sooth the pain of the phantom limb syndrome. One solution is virtual technology that allows the brain to think that the missing limb still exist. Another solution is the mirror box. The mirror box is a mox with a mirror in the center that splits the box into two sections. When you place the exisiting arm into the box and look at the reflections it tricks the brain to think that the other arm co exist, and the individual feels automatic pain relief. Most individuals get so excited about the illusion of the missing limb they almost likely result to tears of joy. I grew an interest to this theory when my cousin James lost his left arm in a motorcycle accident. Growing through the amputation was a real painful experience for him. After the healing process he still found himself experiencing pain coming from his direct fingers that did not exist. He would tell me how sometimes he would still feel the urge to pick something up and when he would go reach for it he could feel his fingers and hand actually wrap around the object. He told me how he experienced unbearable itching in his non existent hand and pain that would keep him up through the night although the wound was already healed. Its amazing how your brain can alter its perception of your limbs and change them so that the sensation can exist in a different area of your body and make you feel as if a missing part of you still exist. I have never heard about phantom limb before and it is very interesting to me. I think it would be common to try to use an arm or leg that you may not have because of habit, but to feel pain really shows us what power the brain has. Sorry to hear about your cousin. Hope he is doing well. 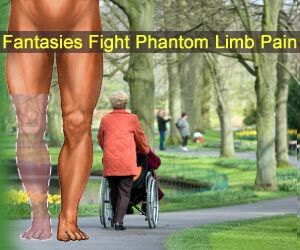 I have learned about Phantom Limbs before and it seems like a devasting event to go through. It must be hard to understand as well. I have never heard of Phantom Limbs before. Thank you for sharing this information. I found your blog to be very interesting. It's crazy to me that the brain can fool the body like it does for these people. What an awful experience. The mirror box is very interesting to me as well. Your post has intrigued me to do research and find out more about this mysterious syndrome.